I love to celebrate the everyday milestones in our family’s life. 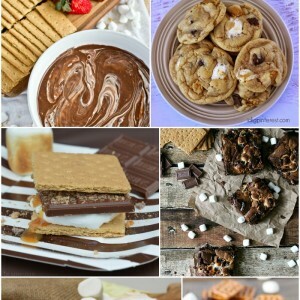 Back to school is right around the corner for my two boys, and I have been promising them a s’mores buffet all summer long. 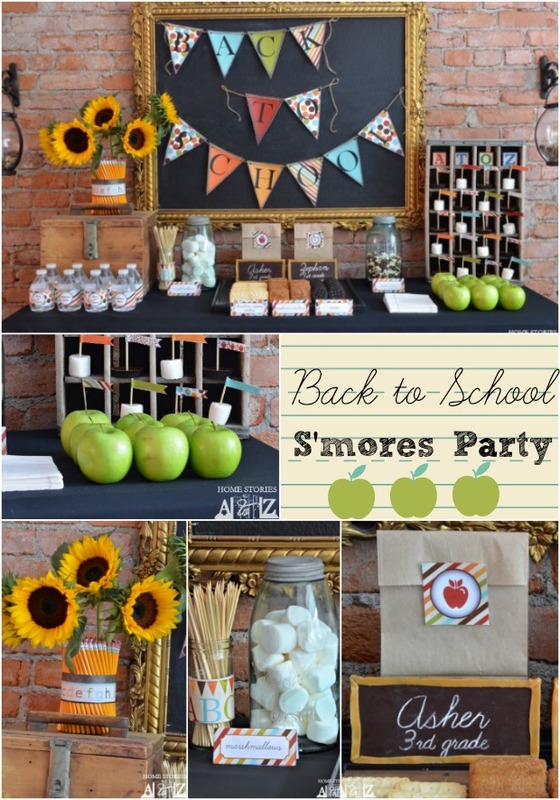 I decided to make good on that promise by killing two birds with one stone with a Back to School: S is for S’mores, Goodbye Summer, Hello New School Year Party! 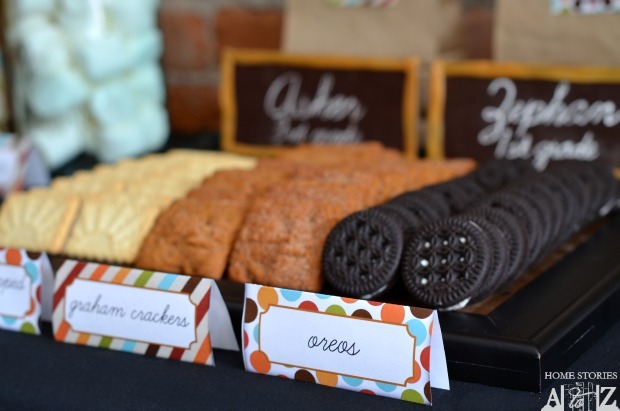 It’s a wordy name for a party, but that is what happens when a celebration is multi-tasking *wink*. 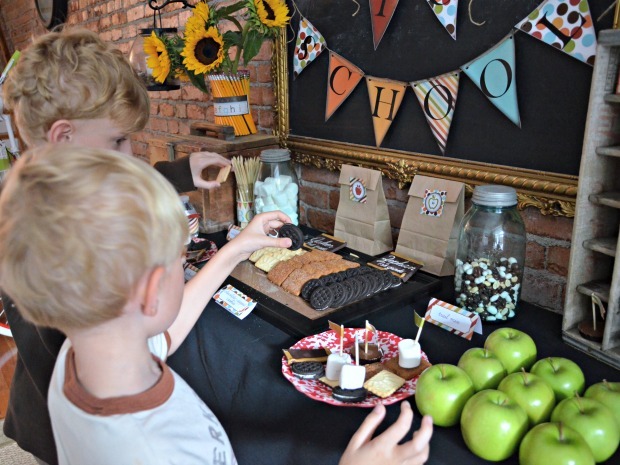 This party was incredibly fun to put together and is filled with easy do it yourself decor. I’m excited to share the details with you! I am sure by now you have probably seen this flower vase trick before, but it is definitely worth revisiting. I use this trick frequently in decorating. All you have to do to create this look is take a pillar vase (or even a pillar candle as seen in my Cinnamon Stick Candle post) and place a rubber band around the center of the vase. 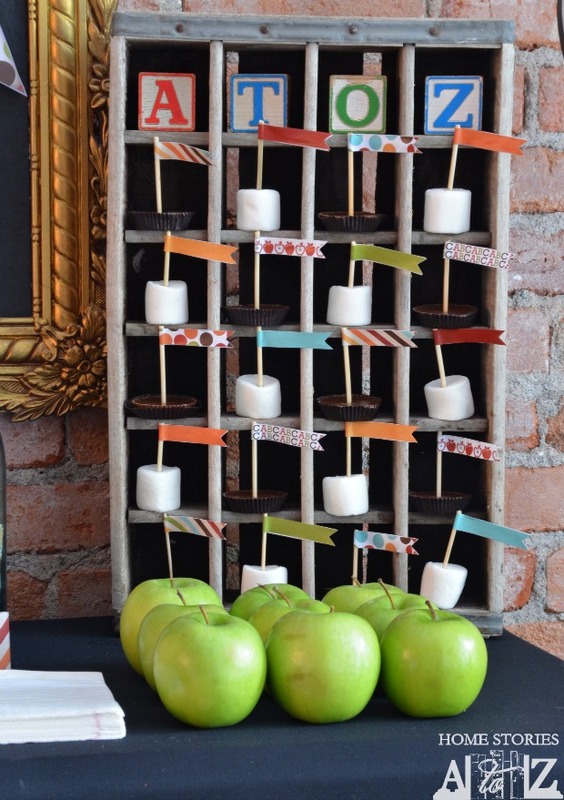 Next, slip pencils, crayons, candy canes, cinnamon sticks, or even asparagus under the rubber band until the items cover the circumference of the vase. Cover the rubber band with ribbon, washi tape, or a paper garland and you are done! 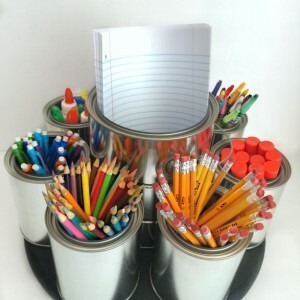 I like the look of a bit of a twist to my pencils, so I fanned them out on the vase and covered the rubber band with a free paper printable that you can find here. 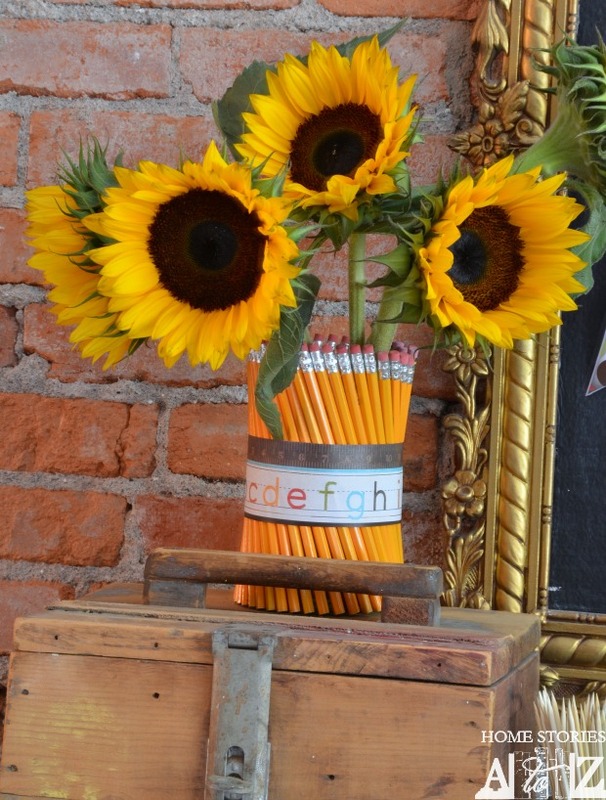 Wouldn’t this bouquet make a fantastic teacher appreciation gift? The best part is that it costs less than $10 to make including the flowers and it looks fabulous. I wanted a vintage back to school vibe for our party, so I shopped our basement and found an old toolbox crate that Matt’s grandfather made and a vintage 7-up crate. I love to shop the house for unexpected props in my decor! 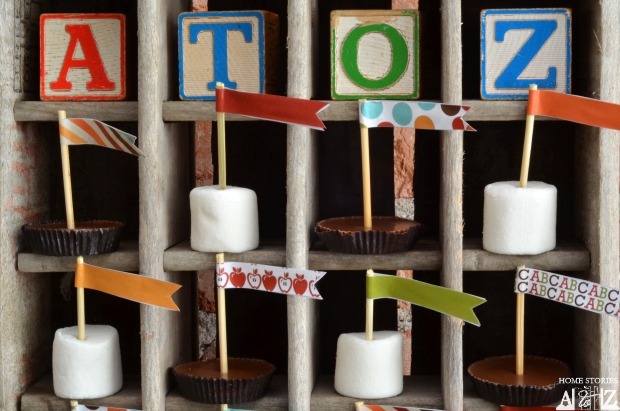 At the top of the crate, I placed vintage letter blocks with ” A to Z” at the top. A sweet shout out to my boys Asher and Zephan (the A to Z in my blog name). The pennant flags were printed out on my laser printer, cut out, and glued to wooden skewers. 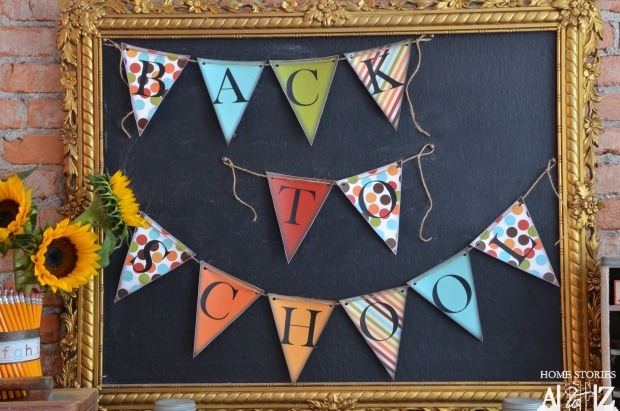 I used the chalkboard from our master bedroom for the Back to School pennant banner. 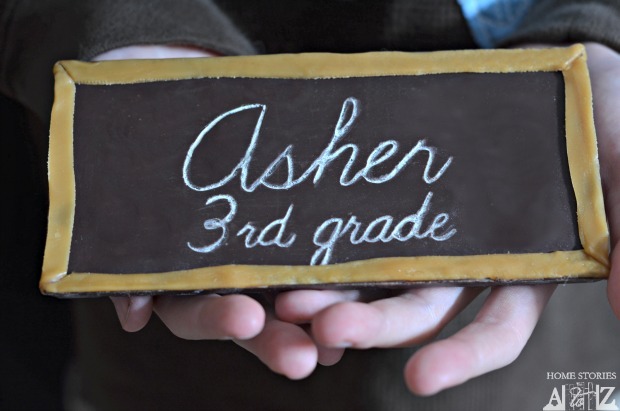 You can see how I created the foam board chalkboard here. I used my Silhouette Cameo to cut out the black vinyl letters. 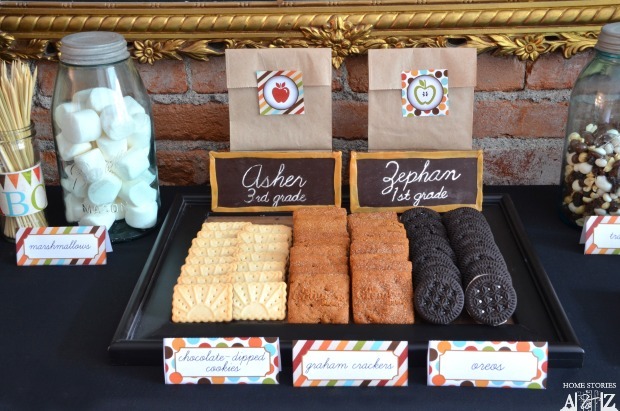 My boys are gluten free, so for the buffet I chose a variety of store-bought gluten free cookies, graham crackers, and trail mix. 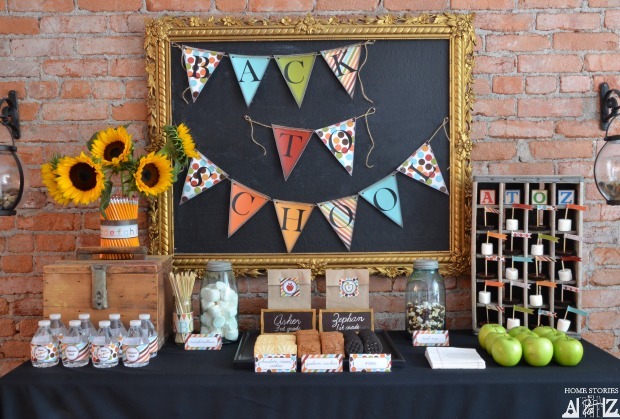 The brown paper bags contained some necessary school supplies and the chalkboard candy bars deserve their own post which is coming soon! 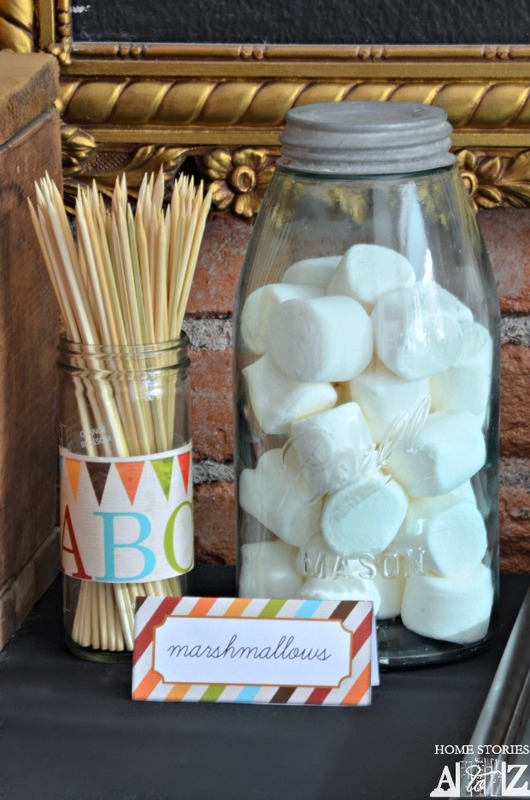 I housed the marshmallows and trail mix in my vintage blue Ball jars and an old honey jar served as the wood skewer holder. 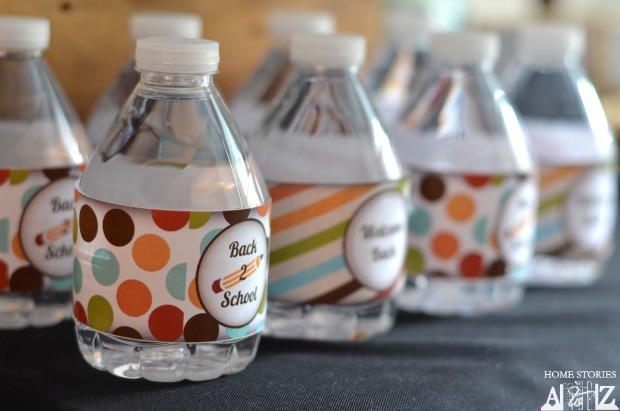 And of course everyone works up a thirst after eating all of those gooey s’mores, so we had to have mini-water bottles complete with adorable Back to School labels. I’m not going to lie. This party was a lot of work to put together for just our little family of four, but I don’t regret doing it. We celebrate little things in simple ways all of the time around here, but sometimes I like to “go big” just because it is fun to do so. I know I am creating memories and reminding my boys that everyday moments can be celebrated. What makes it all the more fun is how grateful and delighted my guys are by my efforts! 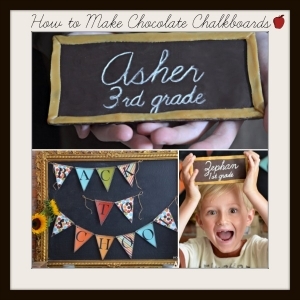 For a full step-by-step tutorial on how to create your own Chocolate Chalkboards click here. Lined paper napkins from Target. 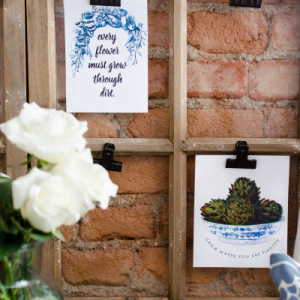 Back to School Free Printables. Another Free Printable that I used. What lucky boys to have a super creative mum. Everything looks fabulous. So precious. Wow. I love how you have that brick wall as a backdrop. I lack any type of empty wall over here. So sweet to do all of that. We are similar in going big for little things. Saving all of these ideas. Thank you! What a fun party! All of the decorations turned out so cute. I’m in love!!! What a great idea! I start on Tuesday. Will you put together something like this for me? Seriously–so cute! I would totally make something like this for my Justa!